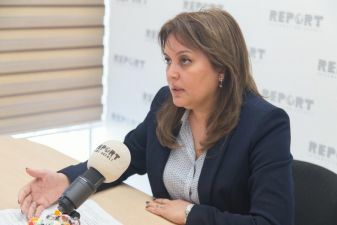 CASPIAN ECOLOGY - Umayra Tagiyeva: "Use of disposable plastic bags will be forbidden in Azerbaijan"
Baku. 28 November. REPORT.AZ/ Report interviews Umayra Tagiyeva, Head of the Department of Work with Social Agencies, Environmental Awareness and Science, Department of Ecological Education and Public Relations of the Ministry of Ecology and Natural (MENR) Resources. - Are plastic wastes extremely harmful? - Plastic packaging wastes, in particular polyethylene bags, are one of the main contributors to pollution. 50% of plastic packaging products have been produced over the past 20-25 years. One of the factors that complicates the situation in this regard is the increase in plastic wastes year by year without disintegrating over 100 years. Thus, the elimination of negative impacts of the plastic wastes on the nature is considered to be a priority in terms of soundy environment. - What situation is observed throughout the world? - Some European countries, for example, the Netherlands, Slovenia, the Czech Republic, Slovakia, Poland, Sweden, Finland, Latvia and Lithuania generate 10-19 kg of plastic waste per capita. A relevant legislative framework has been established to reduce or ban plastic packaging in many developed countries. Work is underway to improve the collection and recycling of waste by using various economic mechanisms. At present, many European countries usually give preference to fabric bags that can be used for several times and easily disintegrated packaging materials. - How things are going in Azerbaijan? - According to the analysis based on the data by the State Statistical Committee in Azerbaijan, 24 kg of plastic waste is generated per capita per year. According to the information of Statistical Committee and the State Customs Committee of Azerbaijan, production of plastic bags in the country grew twofold in 2009, while import of these products to the country increased by 5 times. - What is being done to improve the situation? - The Ministry of Ecology and Natural Resources carries out consistent works to resolve this issue in Azerbaijan. The Ministry of Ecology and Natural Resources implements relevant works on introducing payments for plastic bags beginning from the next year and is expected to ban use of plastic bags up to 20 micron in the country. We think that these steps will lead to progress in the solution of the problem, to prevent additional air pollution and the reduction of possible consequences for human health. If everyone has the right to live in a clean environment, then no one has the right to pollute this environment.